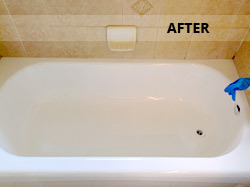 Frank's All Surface Refinishing can Reglaze any kind of Bathtub: porcelain, fiberglass, cultured marble, or acrylic. No matter what kind of Bathtub you have, we will put on a high gloss finish that will last for years. Some tubs have developed rust that will show up around the drain and overflow plate. We chip away the rust and if necessary, apply a metal patch which is covered by a smooth Bondo patch. Other Bathtubs may have just lost their glossy finish and sometimes only a color change is desired. 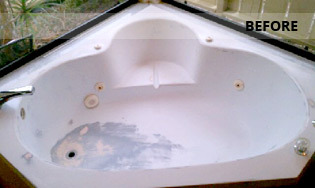 Chips and scratches can also make your Bathtub look old and worn out. 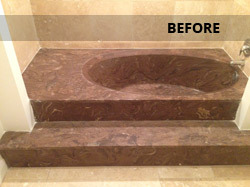 Within a few hours your tub is transformed to a new- like condition. 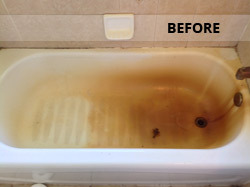 You won't believe the difference and you can use your Bathtub the next day. As with any type of Reglazing, the prep work is the key to attaining a high quality job that will last for years. 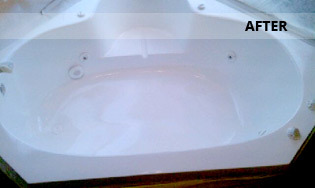 Our technicians will perform all the necessary steps required to insure proper bonding of product to the tub. All of our porcelain tubs are acid etched before a bonding primer is applied. 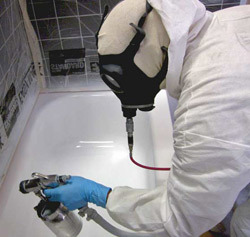 On fiberglass or acrylic Bathtubs, the surface is sanded completely. Finally we are able to apply our 2 part Reglazing resin, which dries to a hard glossy finish. A non skid finish can be applied to the bottom of the tub if requested. All of our Reglazing materials are specifically engineered to adhere to the Bathtub surface. 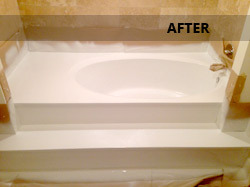 Our technician’s meticulous preparation will insure a beautiful Bathtub surface for many years to come!